If you are a POL you need the right system to manage your testing, and perhaps the connectivity between your instrument(s), Electronic Health Record (EHR), any reference labs you still use and billing services, with easy online ordering for your clients. WebLIMS for POL, with its interface management and reporting tools, is the right LIS solution for you, both now and as you grow. 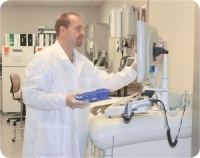 Even though probably doing mostly CLIA-waived testing and perhaps some limited instrument-based diagnostics or microscopy, your POL is no less critical in the world of diagnostics than a reference lab, and in fact arguably more so as tests continue to be simplified and in-house analysis makes more and more sense. The LabLynx HealthCloudPOL solution has been deliberately streamlined for the POL, offering you simple, quick and targeted use to suit the kinds of work you do – at a price that’s affordable for the physician lab. HealthCloudPOL contains everything the typical laboratory for a clinical practice needs in an LIS, and probably significantly more. Like all editions, it is configurable so you can add new tests, define normal ranges, upload your logo and contact details to customize the patient results report, and more. 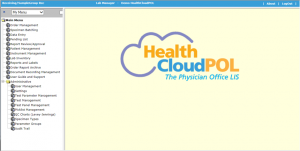 HealthCloudPOL is fully scalable, and in fact includes any Optional Plugins of your choice. Choose from Integration Plugins to additional Reports, Inventory Storage Tracking, Training Tracking and many other features and functions. For a list of available Plugins, see the Optional Plugins section of the HealthCloudPOL Manual, available at HealthCloudPOL.com. As a web browser-based application, it can be hosted on your own servers and integrated with EHRs/EMRs, or other systems so results are delivered automatically and immediately, added to charts, etc., and you can access it from any workstation. And its great configurability means you can add and update tests and processes whenever you want to – without costly development. Your LabLynx HealthCloudPOL LIS solution includes an ERP level of features and functions to give you everything you need, no matter the testing requirements. Need to add a new assay and get results overnight? Generate it in minutes in your LIS, complete with specific ranges and flags for high/low values included in your report automatically. The daily usage of HealthCloudPOL to submit and process orders and produce results reports is at the core of its design. So, these functions are conveniently displayed as the topmost menu items. They are arranged in order, from Order submission, registration/accessioning, where assays are assigned and unique IDs generated linking specimens with the requestor and patient, through batching for individual instruments or processes, results entry (this can be automatic if Interfaced) and report viewing, approval and issue. Lab Inventory – Inventory items including stocks, standards, reagents and even specimens are managed here with regard to storage, amount on hand, components or ‘recipes’, supplier/manufacturer, expiration date and other important details. Instrument Management – This includes all information about the instrument (manufacturer, model, serial number, date purchased, etc. ), the test(s) it performs, etc., plus its maintenance schedule and history and any interfaces, with any associated paperwork or other files uploaded to its page. Administration – Standard administrative or management functions include User Management, Test and Analyte (Parameter) Setup, Picklist Management, QC report and Help Desk. Audit Trail – In support of CLIA, CAP, COLA, HCFA, JCAHO, CLSI and other regulatory standards or organization processes, HCPOL includes audit trail functionality. For examples of these and other available optional reports, see the Report Examples section of the HealthCloudPOL Manual. For HealthCloudPOL subscribers, there are a number of additional optional features and functions available to increase the already impressive list of HealthCloudPOL capabilities, with more being added all the time. To learn what’s available, see the following section in this chapter, Optional Add-Ons. WebLIMS is a secure cloud-hosted application. It is accessed over the Internet and can be used by many individuals simultaneously, either within a site or from anywhere in the world. Access is controlled according to privileges associated with a login ID and password, with encryption ensuring data are protected to ensure compliance with HIPAA, CLIA, ASCLD, FDA and other standards relating to data security. The LIMS/LIS follows the web browser model in that the application processing occurs primarily on the application and database server(s), and the user’s computer, laptop, tablet or mobile device (client) really just provides a window through which the user can view or edit information and operate the system using a standard browser. Microsoft Internet Explorer 9 and later is completely supported, along with Chrome, Safari and Firefox (depending on version, settings etc.). Its user-friendliness and flexibility are by design. This is expressed in the Laboratory Informatics Institute’s LIMSpec LIMS and LIS user requirements Specification POL P0011 Easy registration/accession, and in some of the other standards to which it relates. Since webLIMS.com is a cloud-hosted app, it doesn’t matter to the user about what database it uses (SQL Server) or the server environment. LabLynx, Inc. guarantees 99.9% uptime to its cloud-hosted customers, and boasts the finest cloud infrastructure in the laboratory informatics industry, fully SSAE SOC Type 2 and TIA-942 compliant (see SaaS and Cloud Hosting). LabLynx has employed the finest design and technology, as a long-time leader in web-based informatics, so that you can simply use your LIMS/LIS without having to worry about technical implementation and server/database infrastructure and maintenance. That leaves you free to focus on what you do best.